Little girls love to get dressed in fashionable outfits and one of the most popular and fashionable outfits available for little Muslim girls’ is a girls Abaya. A wide range of designs, styles and colors are available for the little ones. These Abayas look trendy and at the same time are designed keeping in mind the rules and regulations that need to be followed in Islam. Let us have a look at the latest trends available in girls’ Abayas. 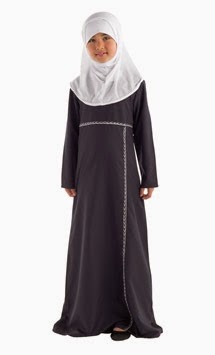 Formal Abaya: When your little princess needs to attend a formal event, pick up a formal Abaya for her. A huge variety of Abayas of various colors are available in the market. These Abayas are decorated with embellishments like stones, sequins work, beads, silver work etc. Two styles that can be easily found in formal Abayas are closed style and front open style. Embroidered Abaya: Another designer Abaya that is popular among the kids is the embroidered Abaya. The fine embroidery is done with quality threads that do not break while washing. To give these Abayas a fantastic look, the embroidery is done on the neckline, sleeves and on the hemline. For daily wear, you can choose an Abaya with light embroidery and for party wear, you can pick an Abaya with heavy embroidery. Designer necks and sleeves: Today you can find kids’ Abayas with an interesting twist. The availability of various necklines and sleeves leaves you with numerous choices. These kids Abayas can be teamed up with colorful Hijabs. Abayas of various cuts: Abayas of various designs and cuts are available in the market. Some of the popular cuts include long cut, butterfly cut, hooded style, to name just a few. Abayas of various fabrics: Kids should be dressed in a comfortable fabric so that they can move around easily and perform their activities without any difficulty. Abayas for girls are available in various fabrics like cotton, crepe, chiffon and georgette, to name just a few. Choose an Abaya made of a fabric that your kid is comfortable in wearing. Online shopping is undoubtedly a convenient option. If you are looking for an exclusive range of Abayas, you can browse the online shopping sites and select any trendy piece for your little one. One can find numerous designs, styles, patterns, sizes and colors easily. Moreover, since these sites do not have to pay the overhead costs, the apparels are available at low prices.